The ideas that still underpin biological thought today were immediately striking in 1859 as well. 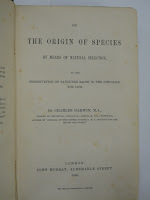 The entire first edition of The Origin of Species sold out the day it was published (although about 500 of the 1250 copies initially printed went to a subscription service that sold to libraries and book societies, as antiquarian booksellers Michèle Kohler and Chris Kohler note1). The original price of the book was 14 shillings. The book underwent six editions while Darwin was alive, and he made changes to each one. Many subsequent editions and formats followed. 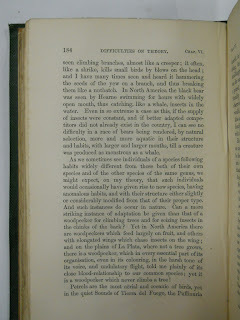 The Robert D. Farber University Archives & Special Collections Department at Brandeis is fortunate to hold four first editions of The Origin of Species, as well as a first American edition published in New York in 1860. One of the first editions includes Charles Darwin’s signature, dated May 4, 1870, tipped in; this and the first American edition are part of the Bern Dibner Collection in the History of Science. Another first edition, bound in original cloth, was the gift of Mr. and Mrs. Samuel H. Maslon. The other two first editions are also bound in the original green cloth and are enclosed in slipcases; both were signed by previous owners. The first edition, from 1859, includes an interesting piece missing in later editions. 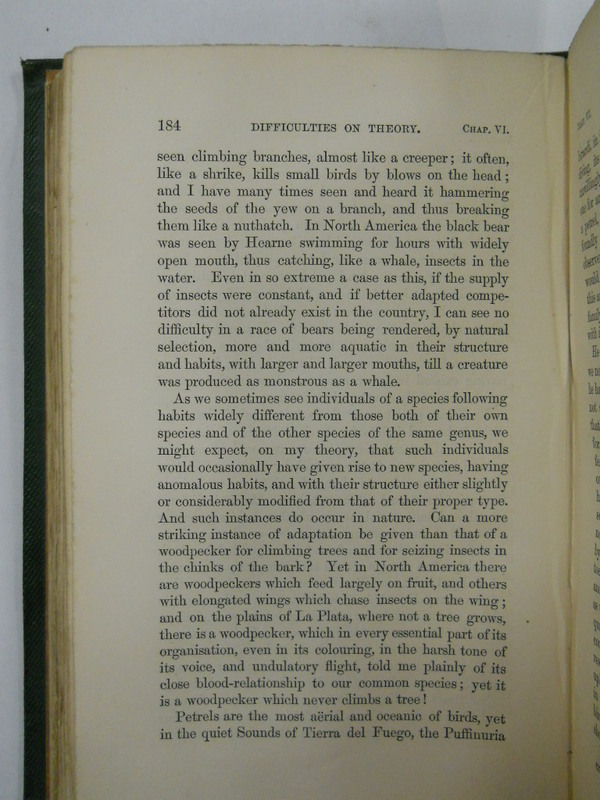 On page 184, Darwin comments on the resemblance of a swimming bear gathering insects into its mouth to a feeding whale. Some scientists in Darwin’s circle found this vague musing that a whale could descend from a bear scientifically unworthy, and it was changed in subsequent releases. However, the story remains in the first American edition. The worldwide popularity of The Origin of Species continues. Before the book was published, Darwin wrote to his publisher: “I am extremely anxious for the subject sake (& God knows not for mere fame) to have my Book translated; & indirectly its being known abroad will do good to English Sale . . . ” In fact, Darwin became the most often-translated scientific writer. Even today, some 100,000 copies of The Origin of Species are sold around the world every year. 1 See the Kohlers’ essay “The Origin of Species as a Book” in The Cambridge Companion to the “Origin of Species,” Michael Ruse and Robert J. Richards, eds. Cambridge University Press, 2008. Cambridge Collections Online.